The Waterfront You Have Been Waiting For! Desirable Arrowhead Point is the setting for this lakefront dream home w/wide lake views, west exposure, level lake access, lakeside patio & gazebo for lakefront entertaining! 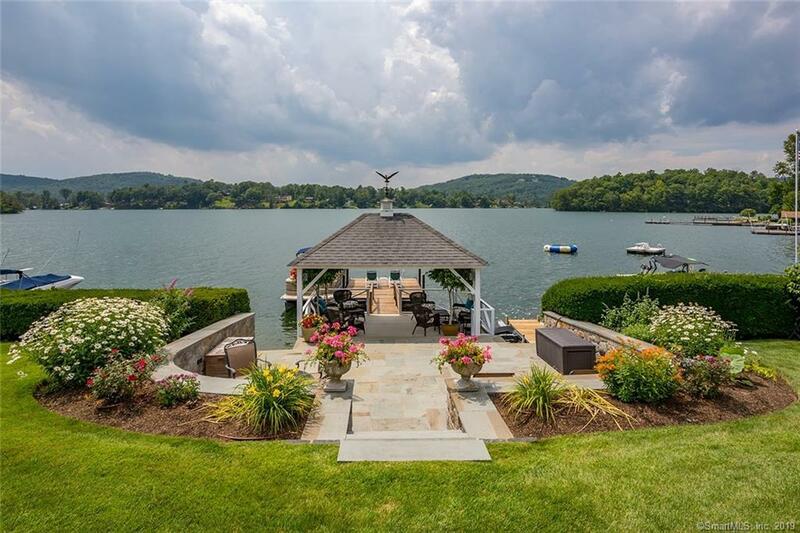 The jewel in the crown, rebuilt in 2009, a stunning New England Shake Style 3000SF waterfront framed by professional landscape, perennial gardens, stone terraces on a private cul-de-sac. A Vaulted Great Room, w/custom pine ceiling, opens to the chef's kitchen w/Subzero, Dacor cooktop & wall ovens, 2 islands, 2 Miele dishwashers, wet bar, wine fridge, granite & offering panoramic views of the lake. Dual gas fireplaces, one in great rm & one in Kitchen warm the heart of the home. The dining area views the lake as well & offers access to outside terraces for dining al fresco. The main level master showcases a 3rd gas fireplace, enticing lake views, sitting area, dual WIC's w/built -ins & custom bath w/soaking tub & frameless glass shower. Two spacious guest rooms w/full bath, bonus room that serves as media/game room, main level laundry/mudroom, hardwood floors throughout, 2 car att. garage w/sweeping paved drive & extra parking plus stunning lake views make this a one of a kind lake find! Upgrades to this home include: Buderus Ultra Efficient wall hung boiler, Buderus 79 gallon hot water heater, security system, automatic Generator, surround sound, water softener, painted in & out in 2017/18, hardwood dock + 2 drive on jet ski docks! A Must for Lake Lovers! ,, excludes dining/kitchen area chandelier. Directions: Candlewood Lake Rd To Kellogg, To Rt On Morton, #6 On Rt- Parking At Top Of Drive Or In Driveway.